Preheat the oven to 350°F. Combine the cayenne, paprika, Chinese five spice and pepper in a small bowl. Rub the mixture all over the ribs and place the ribs meat side down in deep baking sheet or roasting pan. Sometimes I like to use foil to prop the ribs up so they steam better. Add the olive oil to a medium sauce pot and place over medium high heat. Add the green onions and cook until the onions are caramelized and beginning to crisp around the edges. Remove the onions from the pot and set aside. To the same pot add the sugar and melt over medium heat. Once the sugar begins to melt, stir slowly to incorporate until all the sugar has melted and turned into dark/amber color (the sugar will smoke, which is a good indicator of the sugar caramelizing). The second the sugar reaches the desired color, immediately remove the pot away from the heat. Slowly add 3/4 cup soy sauce, pineapple juice, rice wine vinegar and 2 tablespoons hoisin sauce. The caramel will harden, but this is okay. 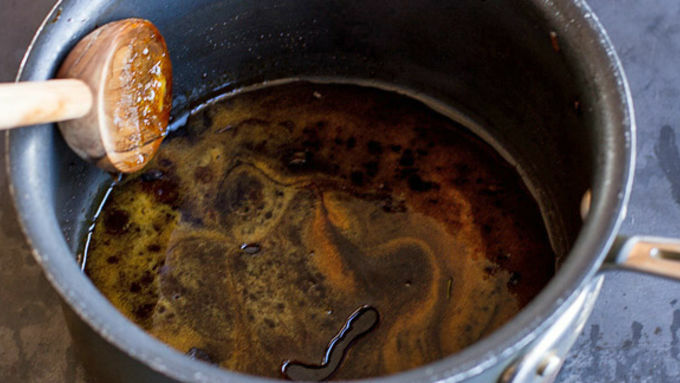 Return the pot to medium-low heat and simmer until the caramel has melted. Once the caramel has melted add the garlic and dijon mustard. Simmer the sauce for 5 or so minutes longer or until it has reduced slightly. Pour the sauce over the ribs. Add the water. Cover the ribs tightly with foil and place in the preheated oven. Bake for 3 1/2 hours, basting the ribs half way through. If too much liquid has evaporated add another cup of water. 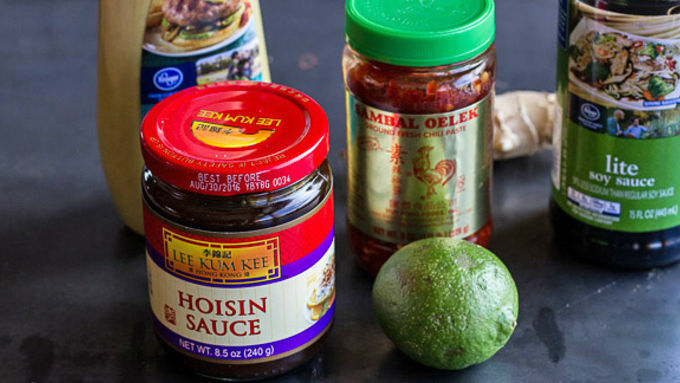 Meanwhile combine the remaining 1/2 cup hoisin sauce, 1/4 cup soy sauce, sambal oelek, ginger, 1 teaspoon rice wine vinegar, lime juice and 2 tablespoons cilantro. Whisk well and place in the fridge until ready to serve. 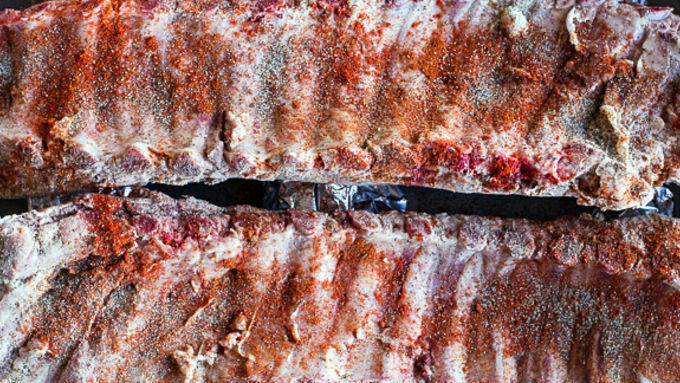 Once the ribs are done cooking, remove them from the oven and carefully remove them from the baking sheet. Strain the remaining liquid through a strainer that has been set over a medium size sauce pot. If needed, add water to make the mixture 1 1/2 to 2 cups. Place the pot over high heat and bring to a boil. Reduce the heat and simmer about 10 minutes or until the sauce had reduce to about 1/2 cup. Preheat the grill to medium heat. 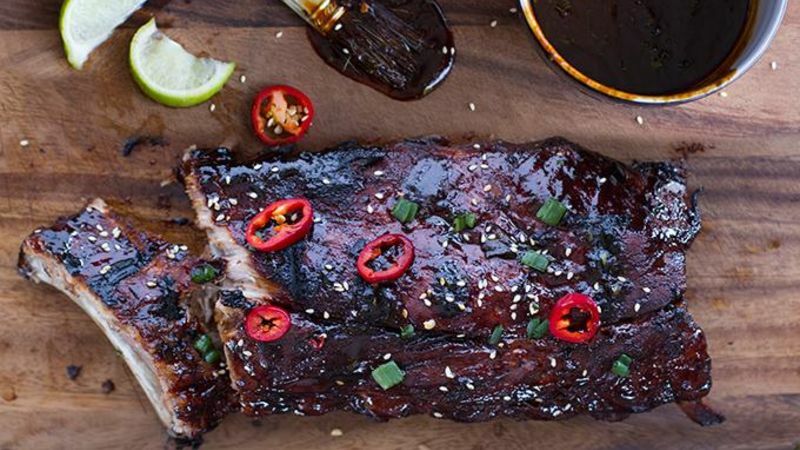 Rub the ribs with the caramel sauce. Place the ribs meat side down on the grill. Grill for no longer than 5-8 minutes, watching closely to make sure the sugars are not caramelizing too quickly and burning. Remove from the grill and place on a serving tray. Sprinkle on the sesame seeds and the remaining cilantro. Serve with the additional sauce and sriracha if desired. 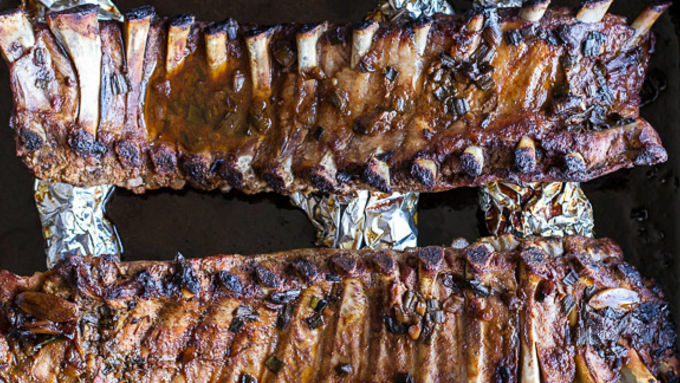 NOTE: Ribs can be baked ahead of time through Step 7. Refrigerate for up to a day, then continue with Steps 8 and 9 to grill at serving time. 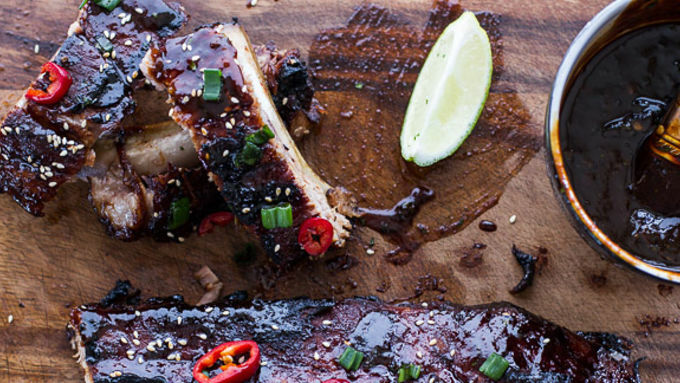 Ribs with sticky caramelized sauce make you glad you have fingers to lick! Grilling season is finally here! And I'm kicking things off with some killer Asian-flavored ribs. Oh man, are you going to be psyched once you try these. I know that BBQ ribs are highly traditional and greatly loved, but I see nothing wrong with switching things up every once and a while. 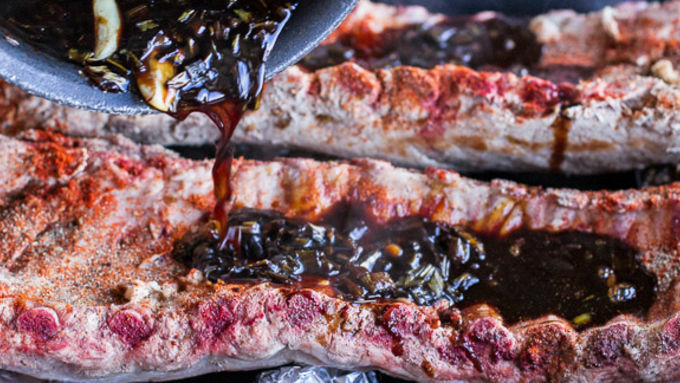 I was thinking how good caramelized Pork Banh Mi Sandwiches are and wondered how that caramelized sauce would be on ribs. I decided to look further into it. I wrote down a recipe in my little notebook and then made some ribs. The first thing you are going to notice when you make these is the smell – it’s so good! 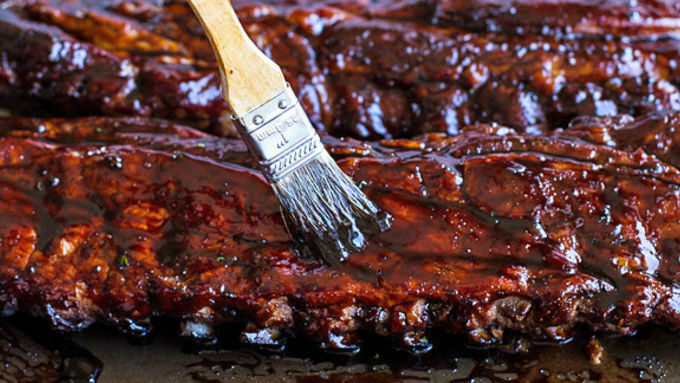 Once you see that scrumptious caramel sauce slathered on these ribs, it’s all over. That’s when it really hits you – these are going to be irresistible. Serve with extra caramelized sauce and devour!